This poem was the third in the cycle of 6 previously mentioned ( see ‘The Day of the Flags’ in the August archive. ) First published as a cheap duplicated pamphlet( 6d old money ) and sold out in the midst of the demonstration against the Prince of Wales in Swansea after his Investiture. All day long I was followed by 2 members of Special Branch with nothing better to do. Hey I can do immaturity as well! 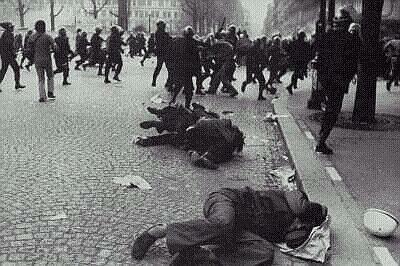 The pic is an unaccredited one taken during the French May Days of '68. Gold star to the scholar who can identify the quotation in the poem.